Nearly 80% of Travellers in a survey in South Dublin say they themselves or someone in their family has suffered from depression. This compares with just 8% of the general population who reported symptoms of moderate depression as per Census 2016. 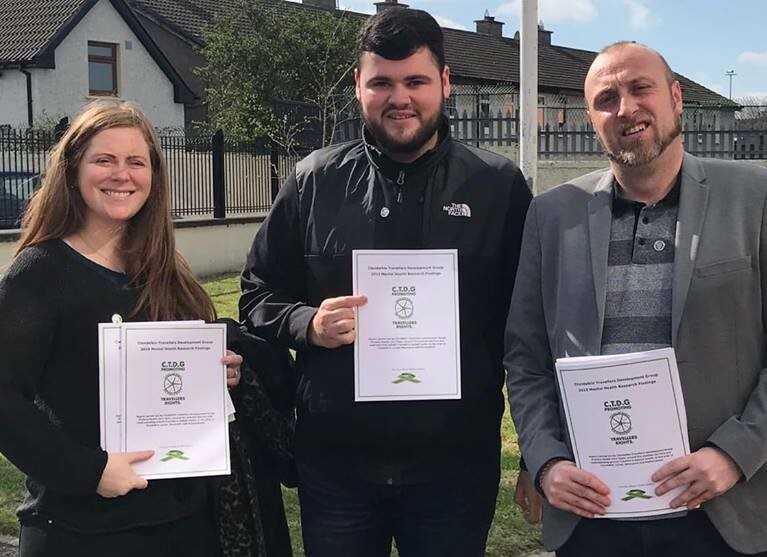 More mental health services need to focus on target work to create a safe and more inclusive space for Travellers, the report by Clondalkin Traveller Development Group recommends. The factors impacting negatively on Traveller mental health were identified as loneliness, discrimination, drug addiction, family break up, children’s mental health and financial hardship. Suicide and self-harm are also major factors as 74% said they had family relations who tried to self-harm. The survey was carried out by Clondalkin Traveller Primary Healthcare Project and surveyed 97 Travellers living in Clondalkin, Lucan, Newcastle and Palmerstown areas. Photo: LtoR – Gráinne Meehan, Martin Reilly and Patrick Reilly from Pavee Point’s health team.